Al-Ittihad Al-Youm learned today that the referees' committee of the Football Federation sent an urgent circular to the phones of all stadium judges demanding that they refrain from any formal or friendly matches without an ambulance since the beginning of the game. This circular comes against the backdrop of Al-Jazeera player Ahmed Rabie, who suffered a serious injury from an internal bleeding in the head while hitting a light pole during a friendly match with Emirates club in the preparations of the two teams of the Arabian Gulf League. The player is currently in Rashid Hospital in Dubai Concentrated. The General Authority for Sports has also moved to inspect sports facilities in compliance with the directives of His Highness Sheikh Mohammed bin Rashid Al Maktoum, Vice President and Prime Minister of the UAE and Ruler of Dubai, and to safeguard the safety and safety of its citizens. The Commission coordinated with the competent bodies to form task forces in this regard. Saeed Abdul Ghaffar, Secretary-General of the General Authority for Sport, said that the Authority has started to work directly in accordance with the directives of His Highness Sheikh Mohammed bin Rashid Al Maktoum, as this is a direct mandate to move and implement all safety and security standards. He stressed that the Commission will not hesitate to take all actions in this matter in order to preserve the lives of athletes and the safety of our children, and to avoid repeating what happened. Abdul Ghaffar said that the team assigned to the Commission in meetings and ongoing visits began since the High Directive and visited yesterday the stadiums of the Football Association to find out the facts of the incident and to clarify the lack of provision and implementation of maintenance and safety and security standards in the facilities of the Federation. Rashid Hospital in Dubai to visit Ahmed Rabie, and check on his health. Al-Ittihad Al-Youm learned that the football federation decided temporarily to close the stadium which witnessed the injury of the player in order to solve the problem of the lighting pole, which needs to be removed or covered with sponge while inspecting the area surrounding the stadium, as well as the rest of the stadiums within the Football Association building in Al Khawaneej In Dubai, which needs to review safety factors and standards for players and participants. Founded in more than 10 years and officially inaugurated in March 2014, the Football Union Building has four stadiums, two of which are grass courts, another artificial grass (Tartan), and another for lounges. 1 - The stadium should be away from any obstacles that endanger the lives of players, such as poles and other lighting. 2 - If the columns should be covered with spongy leaves. 3 - availability of an ambulance equipped with all medical equipment. 4 - availability of a specialist doctor and a paramedic. 5 - match the players' shoes to safety conditions. 6 - Wear players shielded in their feet to avoid injury. The former chairman of the referees committee, former international referee Mohamed Omar, stressed the importance of providing certain safety conditions before any match, whether official or friendly. Mohamed Omar told Emirates Today: "There are people who are authorized to check the safety standards in any stadium where the matches are held. They are referees, referees, the referee of the match, the referees' controller and the referee in coordination with the organizer or host of the match. Federation of the ball or Nadia ». "The presence of an ambulance on the pitch is a very important condition before any match is played, and the stadium itself is in accordance with the legal conditions allowed by either FIFA or national federations, such as the absence of symptoms or objects that pose a danger to The players 'lives and the technical equipment of the two teams at a safe distance away from the public, and even the players' shoes must be in accordance with specific specifications so as not to cause harm to other players, and oblige the player to wear a shield in the foot in anticipation of any injuries and others ». 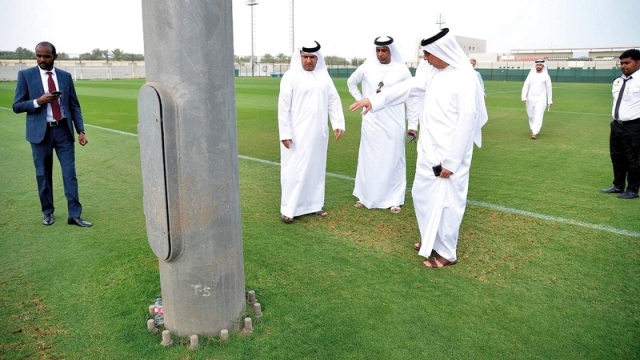 Omar pointed out that the stadium on which Al Jazeera and the Emirates were friendly did not meet the required safety conditions, causing the player to suffer severe injury after colliding with the lighting pole in the stadium. "Before the beginning of the football season, every year, there are conditions and standards for safety in stadiums sent under the direct supervision of the Football Association of the clubs concerned and others, as well as the referees and persons responsible for organizing the matches.